Orlov (orloff) diamond which is also known as Amsterdam or Lasarev is probably the finest of diamonds ever mined in India. Orlov famous diamond was discovered in the Killur mines of Golconda, India at the beginning of 17th century. In its original condition it was a large portion, weighing about 300 carats. It was acquired by Shah Jahan who had it cut in the form of a high rose with a large number of small facets. It is believed that the diamond was a part of an eye of the statue of the presiding deity of the Sri Ranganathaswamy Temple of Srirangam in southern India. The diamond was stolen from the statue by a French deserter around 1750. The as yet unnamed stone passed from merchant to merchant, eventually appearing for sale in Amsterdam. Shaffrass, an Iranian millionaire who then owned the diamond, sold the famous diamond to Prince Gregori Grigorievich Orlov in 1773 to total amount of 400,000 Dutch florins. 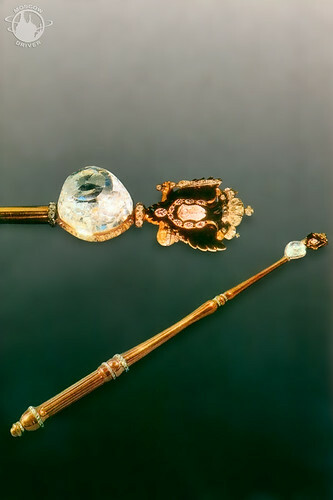 The famous Orlov diamond eventually was presented to the Empress Catherine II of Russia. The sum paid is said to have been 400,000 roubles, or according to another version, £90,000. The dada released by its current owner Kremlin Diamond Fund, give the Orlov's measurements as 32 millimetres x 35 millimetres x 21 millimetres, its weight being 189.62 carats (37.924 g).